The Organ was originally built for Dr. Giles of Milton Hall in 1891 and, upon his death, was moved to St. George’s by Henry Booth in 1895. It has 3 manuals plus foot pedals. In 1895 improvements were made during the move from Milton by Miller’s of Cambridge for the installation at St. George’s. In 1903 the entire organ was removed and taken to Cambridge by Miller and Sons where it underwent a complete overhaul - this ‘new’ enlarged organ contained 1654 pipes and 31 stops. At this time the organ was turned to face across the chancel to accommodate the new pedal open wood 16, a large set of bellows and a new double flute 4ft. for the Great Organ made from wood and having two mouths. In 1963 the organ was completely overhauled and re-built. Work was carried out by E.J.Johnson and Son of Cambridge. The pipes underwent re-scaling and re-voicing, all the leather work, except that of the bellows, was either repaired or replaced and it was fitted with an electro-pneumatic action. In 1995 the organ was cleaned and solid state electrics installed. 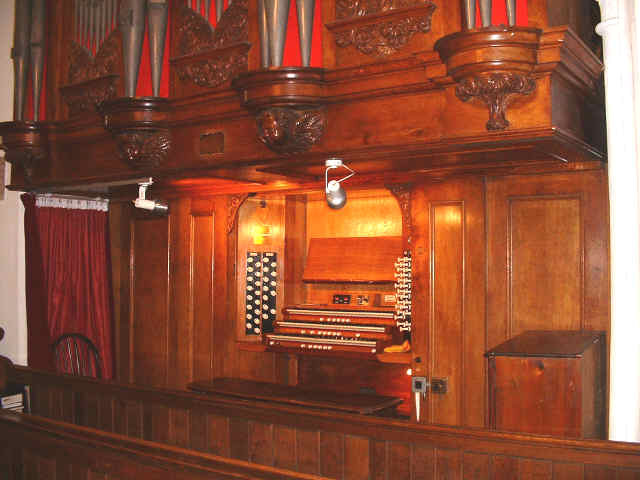 In 2009 the complete organ was tonally re-balanced and all of the pipework regulated to remove the brash sound that was created in some of the previous work. The tonal structure of the original 1890’s instrument has been recaptured to form a more cohesive and natural ensemble by Charles James Organs of Cambridgeshire. In 2011 the bellows, which were showing signs of aging, were removed and re-leathered. During this time many of the pipes were removed and cleaned and the electrical wiring replaced. Three manuals of 56 notes and pedals of 30 notes with just over 2100 pipes. Musical concerts are often held in the church with guest organists and singers. See the Special Events page for further details. We currently do not have a regular organist but have an excellent team of volunteers who freely play at our services on a rota basis. We are most grateful for their continued help - If you are an organist with some spare time on a Sunday morning and wiling to join our team, please contact us giving your details and experience.